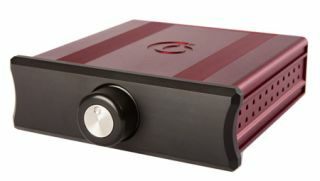 BRISTOL SHOW 2012: Chapter Audio unveils AirPlay streaming amps | What Hi-Fi? Yesterday we saw new streaming products from Chord Electronics and Naim, and today it's the turn of Chapter Air Audio with its Note range of AirPlay streaming amplifiers making their UK debut. The NotePad 250 (£1495) and NotePad Air (£995) are 125W and 95W amplifiers respectively (measured into 8 Ohms), each designed to be driven by any Apple iOS device using AirPlay. Chapter is also be showing its NotePower 400 and 600 mono analogue Class-D amplifiers. Other (non-AirPlay) products in the Chapter range include the Precis 250 integrated amp (2 x 225W), Sonnet-S CD player, Preface S preamp and Couplet 250S power amp (2 x 225W). You can check out the complete Chapter Electronics line-up in the display just outside the Bristol Suite here at the show.